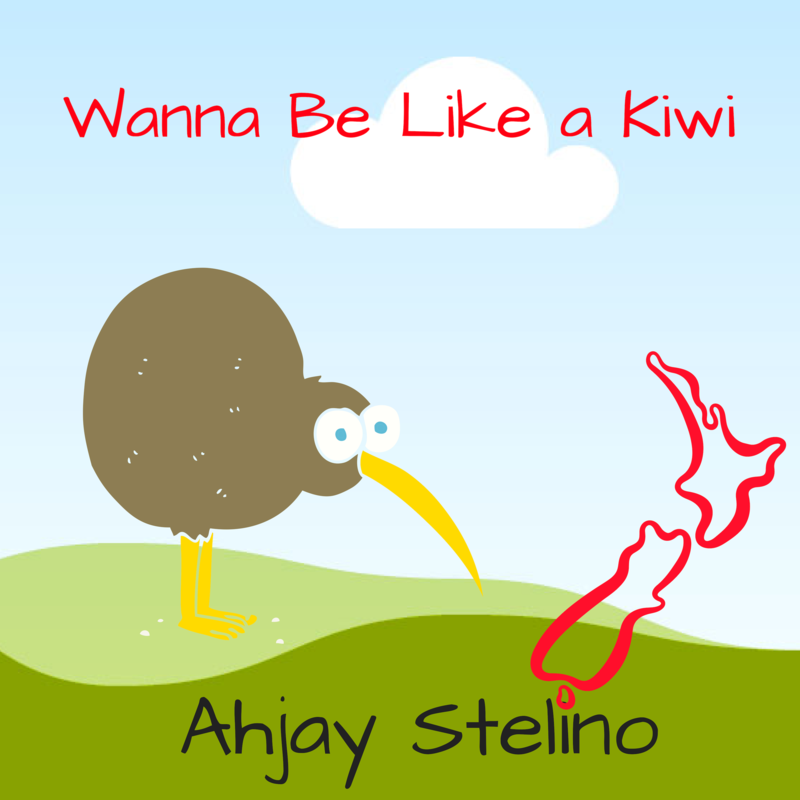 Ahjay Stelino’s “Wanna Be Like a Kiwi” is a uniquely New Zealand collection of songs! Through music the kiwi bird will show how being different is OK, discover about change through the colours of New Zealand, identify New Zealand coins in a flash and learn all about our native owl, the Morepork. A must have addition to any parent’s or classroom’s music collection. All the songs were recorded, arranged, recorded, mixed and mastered by Ahjay at his personal studio, Stelino Studios. My song “Happy Holidays” has won the 2nd place in the adult category of the NZ Ukulele Songwriting Awards! It is a great honour to have won a place in such a highly contested songwriting competition! You can hear the song by clicking the play button below! Here is a brand new song, The Healthy Eating Song (Featuring Leah Emme)! This release can be got as part of a 10 resource healthy eating pack, making a perfect ready-to-use kit for teachers! 1. The Healthy Eating Song mp3: Music is a fun way to learn concepts and this song will have your students learn and remember all about healthy eating in no time! 2. The Healthy Eating Powerpoint Presentation: Need to teach a healthy eating module? Use this ready, 35 page fully editable Powerpoint Presentation that introduces the concept of Healthy Eating in a simple easy to understand manner. 3. The Healthy Eating Song Karaoke mp3: Want to sing the song at school assembly? Use this version of the song with no vocals to sing along. The melody of the song is played on a piano at a low volume in the background of this version to help your students hear which lines they should be singing. 4. The Healthy Eating Song Sheet Music: Play the song using instruments using the sheet music that features the melody line, chords and lyrics for the song. 5. The Healthy Eating Song Lyrics: A lyrics sheet that can be printed and used to help your class learn the lyrics to the song. 6. The Healthy Eating Song Chords: Chords along with lyrics to help you play along to the song. 7. The Healthy Eating Song Easy Chords: Do you feel that you are a great teacher but a beginner musician? Not a problem, included in the pack in the song in the key of C major to make it accessible to even the most basic of guitar and piano players. It’s also handy to use along with your students how are beginning to learn to play an instrument! 8. Food Jokes: Make your healthy eating lesson fun with jokes! Included in the pack are 20 food jokes to keep you students laughing all day long! 9. The Healthy Eating Word Maze: A printable student activity of finding the healthy words hidden amongst the maze! 10. The Healthy Eating Travel Maze: A printable student activity of finding the healthy food and avoid the unhealthy food along with way! I have had the privilege of being invited to be a featured author on TES. TES is home to the world’s largest online community of teachers, with 7.9 million registered users. They are the foremost education news, analysis and opinion site for teachers, school leaders and other educators, delivered through a global family of news sites, blogs, apps, podcasts and the world’s longest-running education magazine. In the featured author post I explain the role of music in teaching and how music can help enhance the learning experience. Listen to the songs available on the TES website at my Learning Songs Page. The song has released internationally on ITunes, Spotify, Amazon and Deezer. Listen to a sample of the song by clicking on the following Youtube video! Ahjay Stelino is now one of the select few providers of songs for the America’s premier kids fitness programme- KID-FIT! Ahjay composes and records custom-made songs for the Kid-Fit fitness and education programmes. This is an exciting partnership for Stelino Studios! Need music for your education programme? Click below to contact Stelino Studios. Ahjay’s production music has been used in the award-winning documentary ‘Birds of a Feather’ by Working Edge Pictures which was a Silver Award Winner for the Spotlight Documentary Film Awards 2015 & an Official Selection for the Sebastopol Documentary Film Festival 2016. Contact Ahjay for music for your next film and TV production! Check you my latest blog post to Friendship Circle, where you can learn suggestions on how to use music to assist movement!